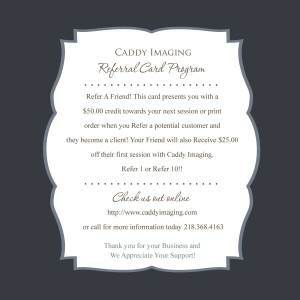 We are starting up a Refer a Friend Program for our existing customers! How does it work, you ask? It’s simple! As a past and important friend of our business, we wanted to reward you for your loyalty. For each friend of yours that books a session with us, we’ll give a $50 discount towards your next session. All your friends have to do is tell us when they book their session that it was you who told them about us. Bingo! All done! Another way to earn the referrals is to call us yourself and tell us that you referred us and who it was. When they book with us, you earn your $50 gift certificate. How’s that for easy? Guess What? Your friend will earn a $25 discount too, just for booking with us because you SENT them! Neat huh? What about if you refer more than one person to us you ask? Combine them. You can combine as many referrals as you get, or you can use them separately. So, if you refer 10 people that book with us, you’ll receive $500 towards a future session. The referrals are good for a year from the date that they are given. The referrals cannot be combined with any other specials or offers.